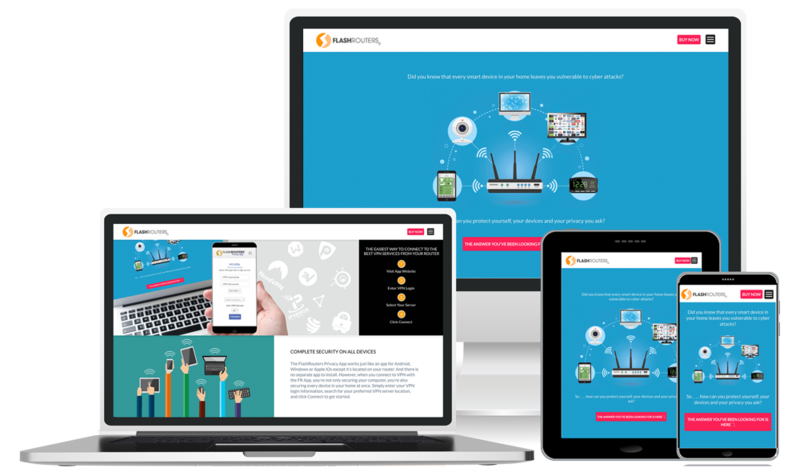 Fake Plastic Websites was commissioned to create a marketing-focused microsite for the company FlashRouters early this year to promote the launch of its new Privacy App. In an age where keeping your data and devices secure is more relevant than ever, the FlashRouters Privacy App puts the power of VPN management for your home or business completely in your hands. In laymen’s terms, FlashRouters resells top-of-the-line WiFi routers that that are preinstalled with superpower firmware that make Virtual Private Network (VPN) Management as simple as facebook. Its firmware also noticeably enhances your router’s performance. In laymen’s terms, they make routers on steroids. For those of you who have worked with VPNs or need speedy connections, this should be music to your ears. The new privacy app allows you to manage your VPN connections on ALL of your devices, whether they be your smart baby monitor, your phone or your computer. This microsite was intended to explain the powerful features of their new app for advanced and novice users alike and I think we did a pretty good job with it. Learn more at the website link below.